Short description By the plugin store owner can shipping orders via shipstation. 1. It will make the order delivered when the carrier make the order status delivered. There is schedule task that knock to the carrier (FedEx, USPS and UPS) side and update the order delivered when the carrier make it delivered. 2. The end point of the shipstation is auto generated. So the store owner do not need to take decision that is this site is secured or not. 3. The store owner can check the order status from the plugin. Here is the sample picture. 4. Store owner can change the carrier key api key from the configuration page of the plugin for USPS and UPS. No credentials needed for FedEx. 5. When store owner update the store from the ShipStation 500 orders will be appear at ShipStation. We keep the amount of the order fixed to 500. Because of performance. It can be increased by store owner request. 6. Admin can enable disable by clicking “Include Customer Order Notes” from the configuration page. To keep the customer order note to the shipstation. 7. Admin can enable disable by clicking “Include NOP Order Notes” from the configuration page. To keep the order’s note to the shipstation. 8. Admin can enable disable by clicking “Send Shipping Email” from the configuration page. 9. Admin can enable disable by clicking “Order Requests To Log” from the configuration page. 10. Admin can enable disable by clicking “Order Xml To Log” from the configuration page. 11. Admin can enable disable by clicking “Shipping Notification Xml To Log” from the configuration page. 12. Admin can enable disable by clicking “Include Paypal Info In Notes” from the configuration page. 13. 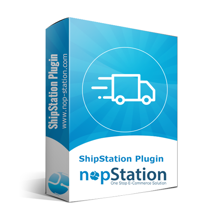 ShipStation custom store setup steps are included to plugin folder. Copy 'NopStation.ShipStation' folder and paste to '~/Plugins/' folder.